Author: Andrew Haruna. Series edited by: Herrmann Jungraithmayr, Norbert Cyffer, Rainer Voßen. 14 pp. Roman, 144 pp. Gùrdùn / Gùrùntùm is a western Chadic language and belongs to the Afro-Asiatic language phylum, further consisting of the Semitic, Omotic and old Egyptian languages. It is spoken in the southern Bauchi area of North-Nigeria. Although Gùrdùn / Gùrùntùm belongs to the endangered languages, so far no research has been published on this scarcely known minority language. With the present volume, the linguist and semi-speaker of Gùrdùn Andrew Haruna tries to fill this gap in the study of the Chadic languages. His book is a data-based systematic language description focusing on the verbal and nominal systems. The data is clearly arranged and has the benefit of longer durability as source material in contrast to more theoretically oriented publications. This grammar is a detailed contribution to the knowlege about the special linguistic situation in the southern Bauchi area and the study of the Chadic languages in general. 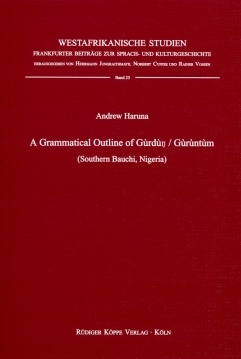 With this „Grammatical Outline of Gùrdùn“, Andrew Haruna has published the first grammar of a South-Bauchi Chadic West-B language. This type of work, concerning a minority language spoken in Bauchi State (Northern Nigeria) and dominated by Hausa, is highly welcome and should be emulated. […] the data carefully transcribed, the basically sound analyses concerning the phonology and the morphology (specially the analysis of conjugation and verb classes) will make the book very useful as a description of a member of a group of languages hitherto neglected. One hopes Haruna will continue his work on Gùrdùn and will soon produce a dictionary and collection of texts with interlinear glossing.